The park, created in 1988 to celebrate the Bicentenary of white settlement of Australia, is the result of a fifteen year campaign by the Glebe Society. This is a good point to reflect on the changing uses of the Bay and consequent topographic changes. Much of the Glebe foreshore remained untouched during the first period of settlement, which was largely residential. Then some was filled for parkland, and even more for industry. With the decline and departure of waterfront industry it has once again become available for parkland. Jubilee Park commemorates fifty years from the incorporation of the borough of Glebe in 1859, the third in Sydney after Randwick and Redfern. At that stage Glebe was still largely residential, but in the early 20th century the bay was gradually reclaimed for industrial purposes. 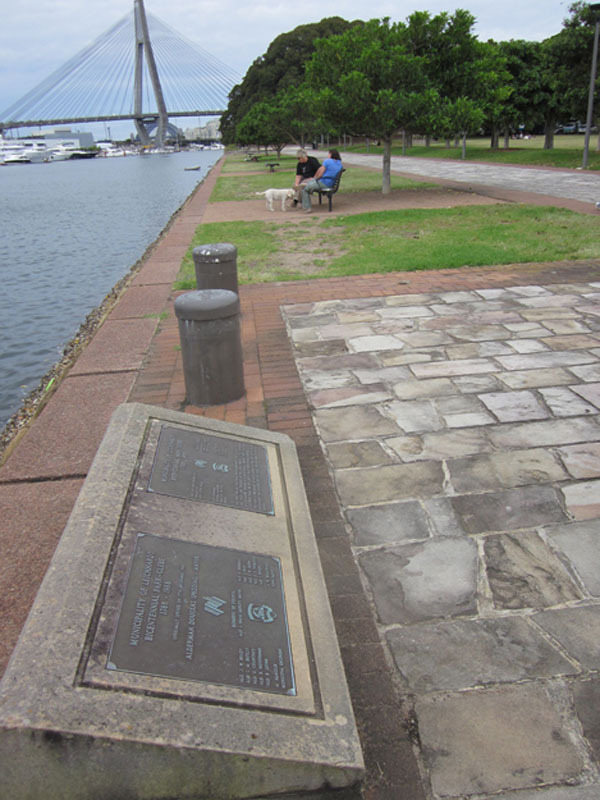 As a result, Jubilee Park had no water frontage and occupied only about half the current area of the park, until the industrial waterfront was cleared and incorporated into the Bicentennial Park in 1988. For much of the nineteenth century waterfront sites were in great demand for industry because water transport, especially of bulky, heavy and dangerous goods, was cheaper and easier. Also, Sydney Harbour and its bays was a significant port for both imports and exports, both overseas and around the Australian coast, and as well as berthage for large vessels and warehousing and bondstores in the Inner Harbour, there was demand for repair and maintenance for both vessels and wharves. Hence foreshores were often reclaimed and lined with straight stone seawalls, as is the case in Glebe. Often too, cliffs near the water were quarried and much of the debris stone used as fill to create level areas for wharfage. The modern bays are thus smaller in area with more regular and level foreshores, but with deeper channels to ease navigation.